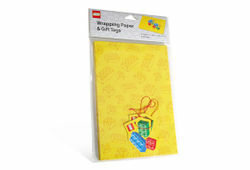 852462 Wrapping Paper is a Holiday set released in 2008. It contains two sheets of 27½" x 39" wrapping paper with pictures of LEGO 2x2 and 2x4 bricks on them. It also contains two gift tags with pictures of a blue 2x4 brick, a red 2x2 brick, and a green 2x4 brick on them. Facts about "852462 Wrapping Paper"